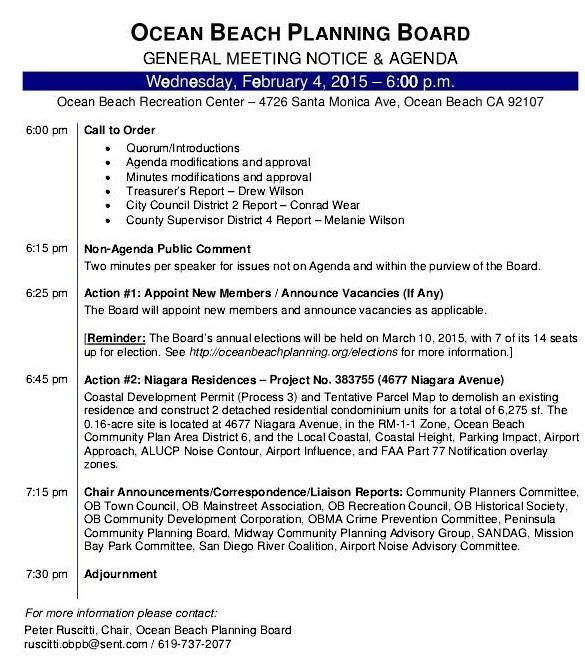 The Ocean Beach Planning Board meets this Wednesday, February 4th, at the OB Rec Center, over at 4726 Santa Monica Avenue, at 6pm sharp. The main action item on the Board’s agenda is the proposed demolition and construction at 4677 Niagara Avenue. The plan is for the developer to demolish the old, old over 100-year-old house on the lot and construct two detached residential condo units. The lot is on a steep slice of Niagara and is .16 acres. It’s a proposal to demolish an over one-hundred year old house at 4677 Niagara Avenue by its new owners, who just purchased it for $690,000 on September 25, 2014 . It was built in 1913. Currently it is a small existing residence with only 959 square feet with 2 bedrooms and 2 bathrooms. The new owners want to tear it down and build two detached condos. The new condos would consist then of over 6 times the square footage of the existing 101 year old for a total of 6,275 square feet. The article generated quite a number of comments, and people were torn between trying to save a 100-year old craftsman house and tearing down what one persona called a “p.o.s.” and were glad to see it go. This is really a shame. But, the owners have the right to do what they want with their property, that I have to agree with. I own a Craftsman that is over 80 years old. It isn’t big either but it is solid as a rock, all the framing and the siding are redwood. The dining room and living room have the curved ceilings, something that looks perfect but was done with lath and plaster by hand. That kind of craftsmanship is gone. I have a built-in ironing board even. Those condos will never weather 100 years like these old cottages. Nor will they ever have the character. Sad. I agree. My house was built in 1941. It may be tiny, but was built by TRUE craftsman who cared about quality and took pride in their work. Too bad more people don’t feel the same way. Well, in defense of the craftspeople, there are people who can do really good work but the system and the market don’t allow for that kind of thing anymore. The only thing that matters is speed – translated labor costs – and that kind of work can’t be done quickly. I remember talking to a guy who was working piecework on a new subdivision. He got a certain amount of money for each kitchen he trimmed out. He said he could do a kitchen in about 20 minutes. He said there would be a bundle of trim waiting in each kitchen, mostly made of plastic. With that bundle and a brad gun, he would do his work. There is no room for craftsmanship in that world. The only places you good work anymore is in custom mansions, luxury condos, and high end hotels. And that’s all the more reason to hang onto an old house, as far as I am concerned. The last house I owned was brand-new (JUNK). Water lines in the bathroom sink transposed, so hot water came out when you turned the cold on, living room windows installed so poorly, that the carpet was soaked every time the sprinklers came on and one neighbor’s fireplace but no chimney–almost burnt the house down when they tried to use it. 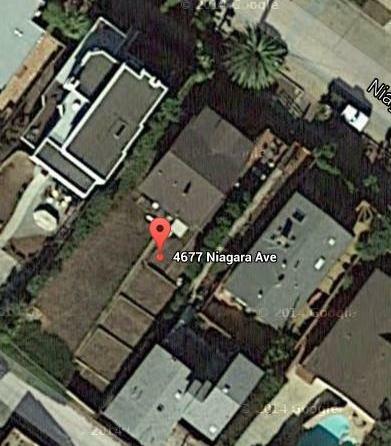 4677 Niagara Avenue is proposed at 6275 sf? Doesn’t the FAR on a 7000 sf lot limit it to 4900? 6275 sf is WAY out of line. I love the look of that place- always have. That being said, foundations that old in this area are most likely spalled past the ability to refurbish. I have been battling with my 1937 cottage foundation for years- epoxying in rebar suports connected to poured casements on each side. That works on a relatively flat lot, but doing it on that much slope? The site is zoned multi-family so the FAR is higher. Oh, my achy, breaky heart…. Scrunch your eyes closed for a sec and envision OB with every lot “built out” with the sort of thing being proposed here. I, for one, will move long before that is a reality, but, in my opinion – there goes the neighborhood. No more OB charm, just a warren of condos like so many other parts of the world. Here’s hoping there can be a stop put to it. Geoff I don’t think that’s right. I don’t think there are any exceptions to the FAR for lots zoned residential in OB. And basically all the residential is zoned multifamily (“RM”). I think the reason that it is being taken to the planning board is they want to build bigger than the zoning rules allow. Otherwise, if everything is within code, you don’t need to. So yes this project violates FAR. Why don’t give it a try, they usually get built. I think you may be on to something but it depends on the information we have. The area is zoned RM1-1 meaning you can have two units on each 3000 square feet. The FAR is .75. If the lot is only 7000 square feet, the maximum square footage would be 5250. One article said .16 acres and that is still about 7000 square feet. Something isn’t adding up with the information we have, no one would really try to get such a large variance in the FAR, the reaction would be entirely negative. And, the reason it has to come before the planning board is because it requires a Coastal Permit. Every new construction project needs to go before the planning board for various considerations, mostly to do with review against the Community plan. Exceeding FAR would also need a variance from the city but the city would ask the OB planning board for their recommendation before considering the variance. If I recall correctly, this particular project involves basements on one or both units and that square footage does not count against the FAR. Another correction. Every new construction project does not need to go before the local planning board. A great number of projects are exempt from planning board review. For example, this project, had it been replacing a small home with a larger home, there is a mechanism to avoid a Coastal Permit that allows the home to escape planning board review. It’s called the 50% rule. If the developer demolishes all but 50% of framing and includes that framing in the new design, the project is exempt from a Coastal Permit. This has happened all over the Coastal Zone. There is no requirement for a project review for every project to see if it conforms to the community plan. The basements would explain the square foot question. What’s really sad is that I make well above median wage and cannot afford to live in OB any longer. Gentrification, I am afraid is inevitable, let’s hope it happens at a snail’s pace. Why is it that we, Obecians, are taking these tear-downs “lying down”, while meanwhile over the hill in Pt. Loma, the neighbors are mobilizing to prevent these horrible carve-ups? Are we too beaten down to care? Too tired from working three jobs so as to pay our rent? Renters who don’t really give a fig? Interested what the City’s historical review said about this property. I suspect that it has been altered substantially from its original state. Project opponents might want to consider attempting to demonstrate with historical photographs that this is not the case. 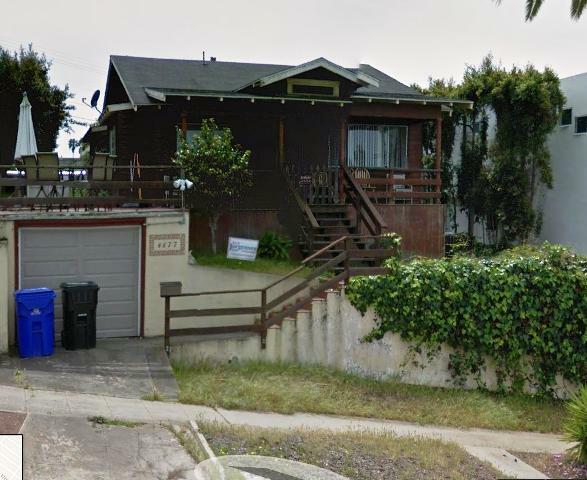 Note: You may have to enter the address “1752 Cable St. San Diego, CA 92107” manually. UPDATE: The Planning Board voted to not recommend the proposal to demolition the 100 year old cottage. More details on Thursday. Thanks for the encouraging example – very nice! I live near the southeast corner of Coronado and Froude where the opposite has just occurred. A couple of years ago the elderly owners of the lovely, but aging, cottage on that corner passed away. A young couple bought the cottage and really worked hard to fix it up: new landscaping, painted outside and in, refinished hardwood floors, modernized kitchen with breakfast bar, etc. I often talked to them and they were a wonderful addition to an older neighborhood, had a baby, and things looked great. Very unfortunately, they had to sell and move back east for family reasons. The owner, a spec buyer, completely ripped the place down, negating all their work. Such a waste of resources! The new place is gigantic for the lot (2+ stories), covers a lot of what was a nice backyard, blocks views, and is not nearly as attractive as what it replaced. The owner/builder never came around to introduce him/herself to any of the neighbors. What a difference people can make. I wish realtors would stress with their buyers that they need to “fit into” the neighborhood, get to know people, etc. before doing something rash like tearing down a just-remodeled home. The loss of the smaller homes with nice yards is a ratchet effect and only goes one direction. It is unfortunate, since it prices out the young couples or families and will gradually change the neighborhood. Hopefully, people will come to appreciate them more universally before it is too late. Unfortunately, OB has become an investment gold mine, has been for a few years. The appraisals on these properties tell the story. The structures are only a small percentage of the appraised value, very small, the lion’s share of the appraisal is for the land. Years ago, OB wasn’t so popular. Instead of building homes to live in, people buy these places and build homes to sell or to turn into vacation rentals. And, there is also a showoff collection of people with money who want to show everyone how much money they do have by building monster homes on lots that once had a small house and a nice yard. OB is changing and change is inevitable. Doesn’t mean we have to like it or quit fighting for what is left. Past fights for the Precise Plan and 30-foot height limit are what has kept the pace of change in check somewhat. Change may be a constant but eventually if this type of change continues OB will just be a nice place to rent a vacation spot for a few weeks and won’t have enough fulltime residents to create a cohesive community. And that is exactly why we need to stop the invasion of short term vacation rentals. Give the choice between OB turning into something PL/Encinitas/Solana Beachish or South Mission- I would choose anything NOT South Mission. Good for them, three cheers for the OB Planning Board.